As part of Israel Apartheid Week 2018, Artists For Palestine UK and War on Want aren’t missing a beat, presenting a compelling and unmistakable musical showcase of some of the leading musical wordsmiths of our time. The evening is dedicated to the ongoing struggle of the Palestinian people and their fight for justice, standing up to 100 years of settler colonialism and celebrating 100 years of (inspiring, and being inspired by) popular struggle for resistance. 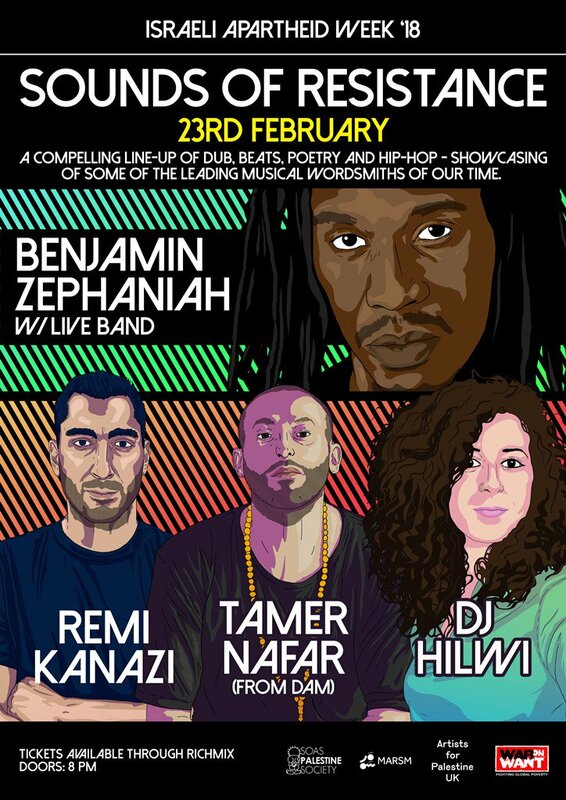 Headlining the night is the one and only Benjamin Zephaniah with his live band, accompanied by a full line-up of dub, beats, poetry and hip-hop. BENJAMIN ZEPHANIAH – Iconic dub poet, novelist and playwright, Zephaniah’s groundbreaking work has been a driving force in reshaping the vibrant landscape of contemporary poetry. Strongly influenced by the musical culture of Jamaica, he uses poetry as ‘street politics’ that galvanise and challenge racism and discrimination, while celebrating the resilience of diversity and community. His uniquely spellbinding performance is an astounding poetic affront and one step closer to overcoming the deeply seated injustices in our world. Zephaniah is a signatory to the Artists’ Pledge for Palestine. TAMER NAFAR – Founding member of the legendary Palestinian rap trio DAM, Tamer’s wit and dedication have helped pave an impressive way for homegrown Arabic hip-hop to flourish and travel far beyond his hometown of Lyd. His cunning solo show is a beat-defying homage to his thoughts, life and inspirations, and a cleverly defined extension of his hip-hop roots and Palestinian heritage. REMI KANAZI – On the heels of a 135-stop tour to promote his new collection, Before the Next Bomb Drops: Rising Up From Brooklyn to Palestine, poet and writer Remi Kanazi has received stunning acclaim for his sharp rhymes and rhythms that accompany the reader and listener on a poetic personal journey. From John Berger to John Pilger, Pulitzer Prize winner Chris Hedges and Omar Barghouti, co-founder of the BDS movement, Kanazi has been praised as a gleaming voice of resistance and reason. DJ HILWI – Rasha Hilwi is a Palestinian writer, journalist, cultural manager and DJ. She was born in the city of Acre and now based in Berlin. Taking you on a music journey, she DJs music and songs from the Middle East, North Africa, West and South Asia and Eastern Europe. Israeli Apartheid Week (IAW) is an international series of events that seeks to raise awareness of Israel’s settler-colonial project and apartheid system* over the Palestinian people and to build support for the growing Boycott, Divestment and Sanctions (BDS) movement.